Where do you suppose this rocky, jagged peak is located? Sierra Nevada? The French Alps? The Himalayas? 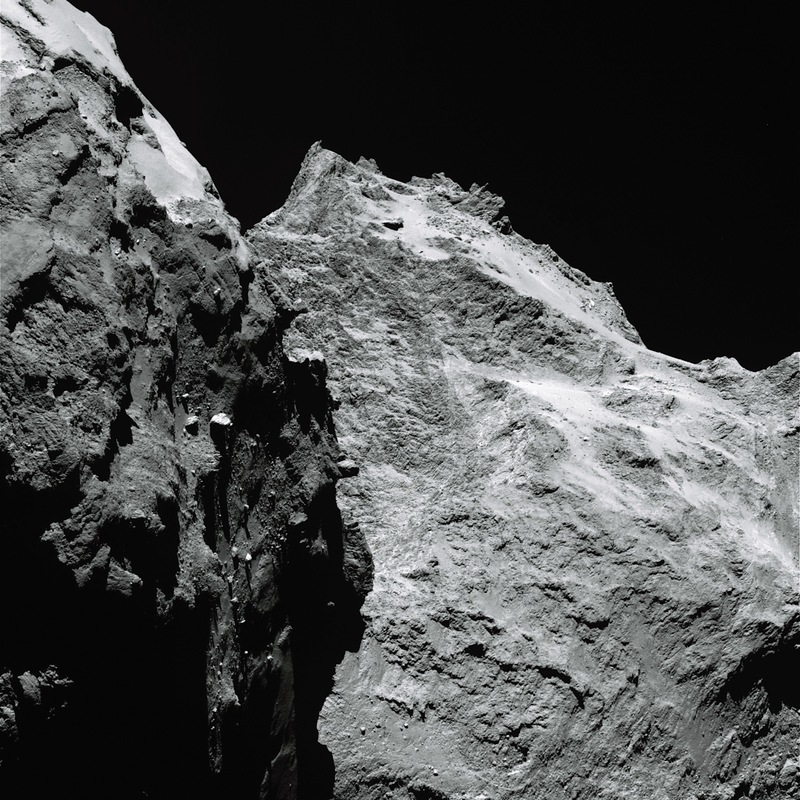 Actually this craggy mountain is located much, much farther away than any of those Earthly ranges (although it’s currently getting closer by the day) – this is a peak on the 4-km-wide nucleus of Comet 67P/Churyumov-Gerasimenko, imaged by ESA’s orbiting Rosetta spacecraft 435 million km away! I wonder when ski season opens? Check out those boulders! Look at those shadows! Incredible. 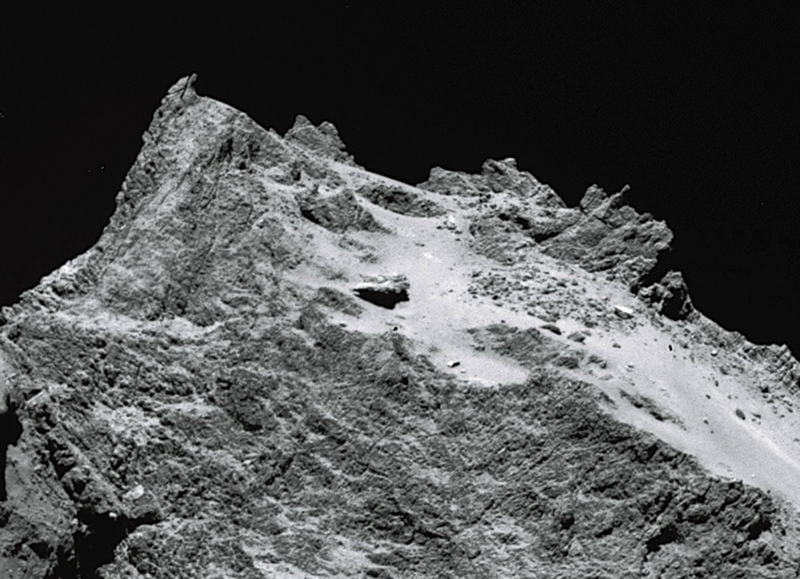 The left part of the image shows a side view of the comet’s “body” while the right is the back of its “head.” One pixel corresponds to 1.1 meters (3.6 feet). The OSIRIS (Optical, Spectroscopic, and Infrared Remote Imaging System) instrument is Rosetta’s main imager, consisting of a narrow-angle and a wide-angle camera. It will be used extensively to study the surface of Comet 67P/C-G as Rosetta continues to orbit it during its voyage toward the Sun. Read more on OSIRIS here. Currently Rosetta is being transitioned to its Global Mapping Phase (GMP), an incredibly intensive process that will determine how close it will come to the surface of the comet as it searches for the best place to deploy the Philae lander in November. Rosetta will descend to about 30 km (18 miles) from 67P, but could be brought even closer if the conditions are right – as close as 9.8km (6 miles) in October! Read more on the ESA Rosetta blog here. Phalie’ landing may show us whether the season is open, or, not…!